An amazing book about a amazing woman's journey becoming a surrogate mother. This book certainly brings tears to the eyes, I loved it!! Great read! While I don’t read a lot of non-fiction, I do enjoy a good memoir so when I was contacted by Shannon Garner and asked to review the account of her journey through surrogacy, I couldn’t resist. Altruistic Surrogacy is a subject that has always fascinated me and, while books like Dawn Barker’s Let Her Go (which I loved), shed some light on it, Shannon Garner has been through it. Happily married with two beautiful children of her own, Shannon’s determination to pursue her desire to be a surrogate drove her to carry out meticulous research for a complex and emotional process that remains, even in today’s day and age, a controversial subject. With honesty and insight, she explores the highs and lows of being an altruistic surrogate in Australia and, in the process, gives the reader a glimpse into an oft misrepresented process with all its legal, clinical and ethical complexities along with the (not always positive) perceptions of friends, family and strangers. Her joys, struggles and fears are all here and I take my hat off to Shannon because it’s not only a difficult decision – one that affects not just the surrogate but her wider family – but it’s also a journey that only a very special few are able to make and her dedication, commitment and self-sacrifice is to be commended. With the flair of a natural storyteller, Shannon has lovingly documented her (and her family’s) profoundly personal journey, answering a lot of questions while writing with heart, humour and a light and friendly tone that sets a warm and intimate atmosphere - which leaves me in no doubt that this is who she is in real life. 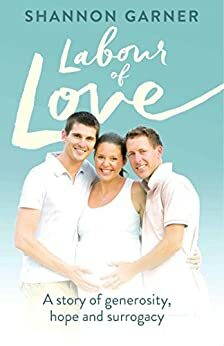 An absorbing, insightful and inspiring memoir with contemporary relevance, Labour of Love is a story of love, family, hope, pure selflessness and the joy of giving that I highly recommend to anyone who is thinking of heading down the surrogacy path as well as those who, like me, just find the surrogacy world to be so fascinating. Labour of Love is a story beautifully conceived—emotive, engaging and honest—with the rollercoaster of emotions of any pregnancy juxtaposed with the very clinical aspects of a highly regulated ‘industry’ and its invasive administrative processes. Importantly, Shannon’s memoir is not an account of heartache and conflict, but an uplifting story the author describes as “a collective love”—one that involves a handful of people who start out strangers and end up so much more than family. What Shannon has written is a positive story about selflessness in the hope more women will consider surrogacy and more people will understand why. Told from the point of view of the surrogate, her no holds barred approach documents the journey before, during and after the pregnancy, including the lengths she goes to, mind, body and soul, to prepare and give “her little passenger” the best start in life. What Shannon couldn’t have prepared herself for were the things she would learn about herself along the way, or the Internet trolls, the naysayers, and the critics keen to plant seeds of doubt, especially when mid-way through the pregnancy came the news that shocked the world and divided opinion—the story of Baby Gammy. Questions and constant scrutiny by the misinformed and curious, added to the responsibility of carrying another couple’s baby (one that wasn’t growing as it should) became overwhelming. Finding strength from unexpected places and painful childhood memories, desperate to show people she was, finally, good enough, Shannon pushes past the negativity of others and her own self-deprecating tendencies to find the courage she needs to selflessly carry and birth a baby that will not be her own. 5.0 out of 5 starsHonest and well written. I read Labour of Love because Shannon is a friend, not because I'm particularly interested in surrogacy. Yet I never could have understood what a sacrifice Shannon and her family made for two men she didn't even know until I read the book. The level of detail is amazing, and the author's ability to recall conversations and situations brings the story to life on the page. The tension builds incrementally throughout the book until the final chapters had me holding my breath with worry for tiny Elsie. Rarely will you read of such an altruistic act, described with honesty and humility. Well done Shannon, you really can write, and I loved reading your book! 5.0 out of 5 starsQuite simply, this is an exquisite book! What a privilege to share Shannon Garner's surrogacy journey! Brimming with selfless love, this is a book which will leave you in awe at how generous and courageous one person can be. Whether you're contemplating surrogacy or not, I encourage everyone who wants to read a real life story which will leave you infused with happiness to pick Labour of Love. An inspiring read. The overarching theme for me was the power of generosity and love as this new extended family was created.